Alo Ritsing: Bio & Choral Music | Santa Barbara Music Publishing, Inc.
Alo Ritsing (b. 1936) is a conductor, composer and teacher at the Heino Eller Music School in Tartu, Estonia, and Professor of Music at Tartu University. 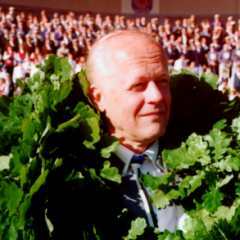 He graduated from Tartu University (Department of Bibliography) in 1960 and from Tallina Music Academy (Department of Choir Conducting) in 1969. In addition to his teaching duties, he serves as chief conductor of three men's choirs and as general conductor of the Estonian Song Festivals. Many of his choral songs have been published in Estonia. Alo Ritsing has 1 titles published with Santa Barbara.